Some players "actually like winning with bad cards", Ben Brode explains. 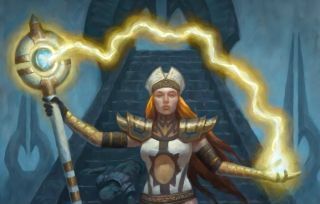 Since Blizzard announced the cards in its Hearthstone One Night in Karazhan adventure earlier this week, many have seized on the topic of the Purify card – a Priest class card universally considered to be crap. Our own Tim Clark called it "one of the worst cards ever printed in Hearthstone". The outcry has grown so loud that Hearthstone lead designer Ben Brode has felt compelled to upload a video justifying it. "We've got lots of reasons why we make cards," Brode explains in the video. "Not every one of those reasons is to position it as a tier one deck. Sometimes we want to allow players to make crazy decks, and some players actually like winning with bad cards. "We try to make competitive cards to shake up the meta game, but that's not the only type of cards we make," he added. It's worth watching the full video (embedded below) for Brode's full response, but the general message is that the card is here to stay despite the Priest class's already rather dire current situation. Interestingly, Brode confirms that Purify won't appear in Arena mode.